When it’s hot and sunny, there’s nothing better than being outside with your baby and the rest of your family. You’ve applied all your sun-cream, and you’re relaxing in your garden or your local park enjoying the day. However, there’s one thing worse than your baby becoming sunburnt, and that’s insects and the bites they give. To help you choose from the best of the best, I’ve done all the hard work for you. Below, you’ll find a collection of leading bug repellents and sprays, all designed with your baby’s well-being in mind. To start my absolute favorites list, I’ve chosen this outstanding repellent so you can say bye-bye to bugs. Suitable for children aged six months and above, this is everything you’ll need in a repellent spray. 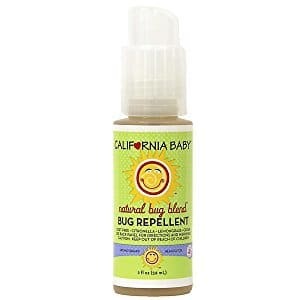 This award-winning product is a friendly, baby-safe, vegan approved spray that excels in repelling all kinds of bugs. This includes fleas, ticks, flies and, most importantly, mosquitos. What's Great About It: With your baby’s well-being in mind, this spray has been rigorously tested for its protection. It’s gluten-free, dairy-free, nut-free, and oat-free. This ensures that your baby won’t have a nasty allergic reaction. Next up, I’ve chosen this advanced formula that’s as kind to your baby’s skin as it is effective. Within this patented repellent spray, you’ll find six key ingredients that give you and your baby all the protection that they need. These ingredients include soybean, peppermint, cedar and lemongrass, all proven to repel insects while protecting your bundle of joy. This natural, GMO- and DEET-free recipe means you can be safe in the knowledge that your child is in safe hands. What's Great About It: In addition to all these amazing features, this spray continues to impress, as this repellent won’t damage or weaken your child’s clothes. It also doesn't hinder sweat and water functions in your child’s skin. This allows your children to enjoy a happy, healthy lifestyle without being bugged. To conclude my list of favorite bug sprays, I’ve chosen the EcoSMART spray. Easily one of the most affordable sprays, it’s also one of the most effective. 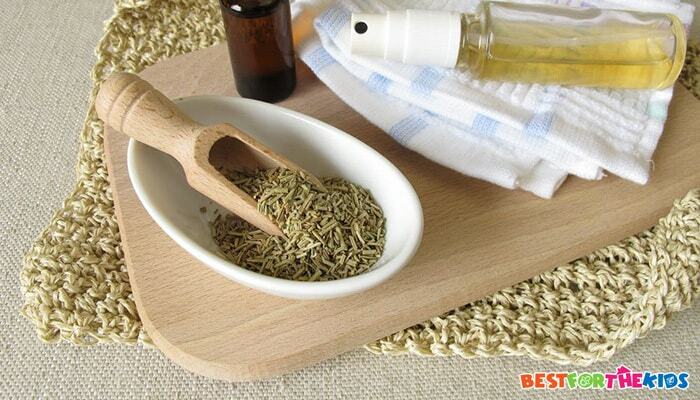 That’s because this formula proactively repels all kinds of nasty bugs and insects. This includes gnats, fleas, ticks, mosquitoes and other biting bugs. What’s more, this level of protection lasts for hours, allowing you to be safe in the knowledge that there’s protection present throughout the day. With your child’s well-being in mind, this formula is designed to be DEET-free and only uses 100% organic insecticides, which means this product is completely safe to use on your children and even your pets. What's Great About It: With the condition of the environment in mind, this product is ideal. That’s because, thanks to its non-toxic formula, it doesn’t contain your local ground water supplies. This makes it an ideal choice for parents concerned about the well-being of their family and their homes. 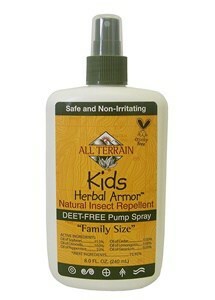 When you think 'bug repellent', it’s easy to think of the chemicals and pesticides that could be in each bottle. That makes it a hard choice knowing which ones are safe for your children. To help you make the right decision, follow my comprehensive buying guide below. Throughout my list of favorites, you’ll have seen the term DEET pop up. DEET is renowned for being one of the most effective chemicals when trying to tackle and repel insects. However, it’s still a chemical. Although it’s not especially harmful to children or adults, it can cause an allergic reaction or irritation to the skin. This is especially prevalent in children and babies since they have more fragile and delicate skin. The current recommendation is to look for a repellent that has between 10-30% DEET concentration. It’s also recommended that babies below the age of two months should have no contact. If your child has particularly sensitive skin, it’s highly recommended that you avoid it at all costs. 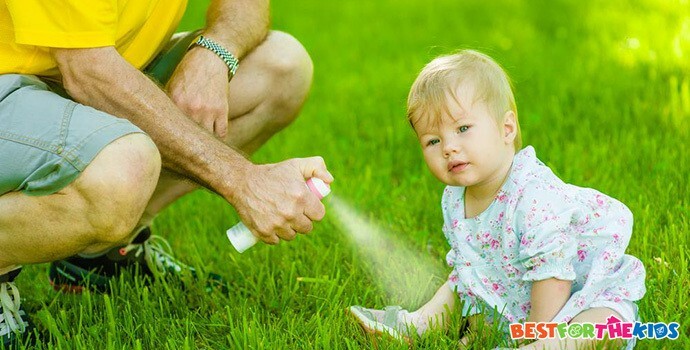 Always check the manufacturer’s recommendation to see whether your chosen repellent is suitable for your child’s age. A basic example would be that some repellents contain the DEET or Picaridin chemical. If your child is quite young, they may get these chemicals on their hands which then go into their mouths, meaning they’re ingesting these chemicals. Always make sure that the product you buy is suitable for the age of your child. You’ll also want to consider the smell of your chosen product. In short, you simply won’t want your child smelling like chemical bug repellent. As you can see from my list, there are many sprays available that come with a light citrus smell. This is far better than the traditional horrible bug spray smell. If your chosen spray has a fragrance, always ensure that it's not toxic to your child’s delicate skin. Now that you’re all up to date with everything there is to know about bug repellent, take your time in choosing the right product for your baby, so you can enjoy your summer days how they’re meant to be enjoyed.